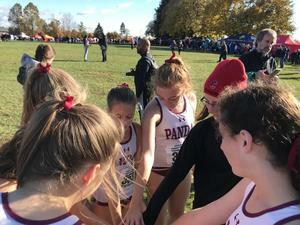 As a Catholic school, our team prays before each meet. Today, I only had one athlete and saw that another PCL team was next to us and asked if they already prayed. They said yes, so I turned to Evelyn and said she and I could pray—when the Prendie Girls (Bonner-Prendie) said,”We can pray again!”, and took Evelyn into a circle and prayed. This is what the PCL is all about. Thank you, Pandas! You are Amazing!" Excellent showing by our Pandas and Patriots!